MIL-CD (Legitimate Music) Exploration and Research. Need your help! Discussion in 'Sega Dreamcast Development and Research' started by Mrneo240, May 9, 2018. Any idea how to do high bitrate? I assume you meant 5,000 kb/s? As 5,000 kB/s is ~39 Mb/s which is of 1080p MPEG2 level of bitrate, overkill for a Dreamcast for sure. The main limitation is the optical drive. The DC reads GD-Roms at max 12x and CD-R at 4x IIRC. That means hard limits on max bitrates of 12 * 150 kB/s * 8 b/B = 14,400 kb/s for a GD-Rom and 4 * 150kB/s * 8 b/B = 4,800 kb/s for a CD-R. But that's only the read speed at the outer rim on the disc because of CAV. Any large file can only reach those speeds near its end, and only if it's at the end of the disc. GDEMU could probably help then! But you might get CPU limited at one point. Try the kvcd pack, it gives good results most of the time. You can change the bitrate in the script, default is 1,500 kb/s IIRC. LuizNai and Anthony817 like this. That means hard limits on max bitrates of 4 * 150kB/s * 8 b/B = 4,800 kb/s for a CD-R.
from the space channel 5 mil-cd. from dps - HEARTBREAK mil-cd. -=FamilyGuy=- and LuizNai like this. From the doc, it should be 4x for the LD section of a GD-Rom. But maybe that's just because it's at the inner of the disc, and that it can actually reach ~8x at the outer edge of a mil-cd. It won't be 12x because of the CD relatively lower pit density compared to a GD-Rom. So ~9,600 kb/s could be attainable as a peak near the outer edge of the disc. Both of those videos are short and probably fairly far from the inner edge of the disc. If you put them at LBA0 in the first session of a data/data mil-cd, they might not play smoothly (without buffering). A compete movie filling a mil-cd to the brim shouldn't have too high a bitrate. Trial/Error is your friend if you want to optimize that. darcagn, LuizNai and Anthony817 like this. I'd love to see what the Dreamcast can do with GDEMU or IDE-MOD on this!!! Anthony817, fafadou and -=FamilyGuy=- like this. Ignore all the metallica stuff, its just what i use as a base for experiments because its quicker than remaking images and setting up everything correctly until im certain the project will work. Showing the menu/software supports 58 tracks. The final scene of the hour long movie. The image file is much larger than a regular cd but the player itself doesnt care. better info coming soon. ensure INFO.CDP is 75 sectors from the start of the session! EXACTLY! NO MORE, NO LESS. soon, ill have a better version of mkisofs that will do it for you. You must use the version attached. i can add source if you want to compile under linux too. MastaG, Anthony817, fafadou and 2 others like this. ensure INFO.CDP is 75 sectors from the start of the session! EXACTLY! NO MORE, NO LESS. * Read the file cdplus/info.cdp from the cd extra disc. * the last session (according to Blue Book). 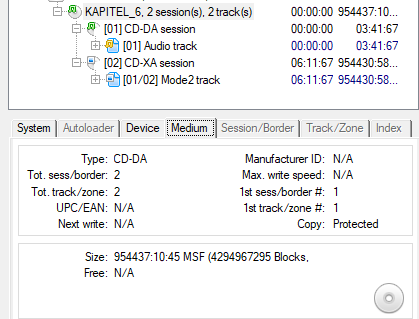 I'd guess modified mkisofs is not the only solution, but there is also can be used any CD mastering software which supports CD Extra/Plus images creation. i only found 1 for old mac, and 1 for old windows. fafadou and LuizNai like this. This is awesome! I want to watch all Dragon Ball movies on my Dreamcast now lol!!! Congrats again bro! Anthony817 and fafadou like this. I want to watch all Dragon Ball movies on my Dreamcast now lol!!! wouldn't we be able to playback slightly-higher-than DVD quality via 480p VGA? A DVD has 4.7 GB of data in MPEG2 ~9.8Mb/s @720x480. The DC typically supports MPEG1, not 2. While a decoder for MPEG 2 could be written in theory, the DC CPU probably couldn't keep up with the complexity, especially not at close to 10Mbps. And the CDs are well under a GB, up to one for a GD-Rom. The Dreamcast can do vcd quality basically. LuizNai, fafadou and TerdFerguson like this. SEGA instead of licensing the DVD technology decided to create its own video disc format and that opened the port for piracy helping the console's demise. They barely supported the MIL-CD format. Really stupid idea. I don't know that I'd call it stupid. The Dreamcast came out almost two years ahead of the PS2, and DVD technology wasn't exactly cheap back then. Sega lowered production costs by extending the lifespan of an existing technology, which was pretty ingenious and thrifty. The GD-ROM format is solid; the problem was Sega didn't protect the MIL-CD format nearly as effectively. But the DVD technology was crucial to achieve the success back then. Both PS2 and Xbox were the winners of that generation, because of the DVD support, which was a new, high definition foundation of the modern home entertainment system. Lowering costs by introducing non competitive and proprietary standards is no go. With hindsight it's obvious, but at the time their choice is understandable. back when exactly ? Dreamcast was 1998 console, while PS2 is 2000 and Xbox is 2001. 2-3 years is huuuge difference, taking in account how fast technologies progressed at the time. moreover, as far as I know, original Dreamcast was not planned / designed as console for 5 or more years, there was planned update after 2-3 years (no totally new Dreamcast 2 but more like 1.5), about the same time PS2/Xbox/etc was released. quite possible there was planned to use DVD drive instead of GD. anyway, returning to topic - why so hype because of Mil-CD SFD videos ? I do not understand. back in the days, we had here sh*tload of DivX video discs for Dreamcast (iirc with DCDivX player), and isn't DivX/Mpeg4 produce better image quality than Mpeg1 ? For me, it's a chance to test the media player that could have been, in an alternate universe where the Dreamcast had more life and Sega stood stronger. That, and I want to make my own MIL-CDs just for fun. Anthony817 and Mrneo240 like this. Exactly, it's interesting in and of itself. No need to actually watch videos using it. megavolt85 and Mrneo240 like this. For me, just documentation and recreation.